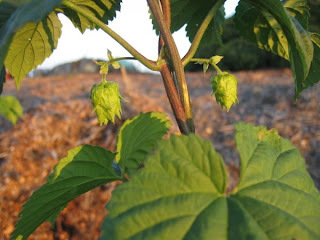 I was at the hop farm yesterday evening and everything seems to be doing fairly well. There's something that's enjoying chewing on the vines, especially new growth. Rabbits have been sighted in the area so that's a distinct possibility. The top row (chinook and centennial) typically always reaches the top wire first. Below is the end of the top row. 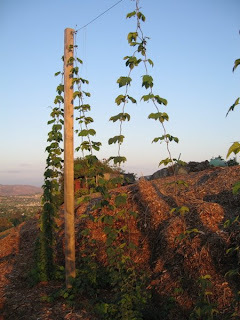 This is the centennial hop that tends to grow best. It has just started to flower so this should be a good season for centennial. 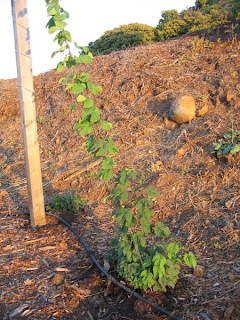 Notice the next hop mound next to the pole that doesn't have a vine long enough to train yet. I'll be checking up on them in a couple of weeks. Below is chinook! As always, this hop loves it here and starts its season already producing. It should be ready for a first harvest mid July. I can typically continue harvesting until October from these vines. The bottom row is having difficulty establishing itself mainly due to some pest that likes to chew on the first vines.